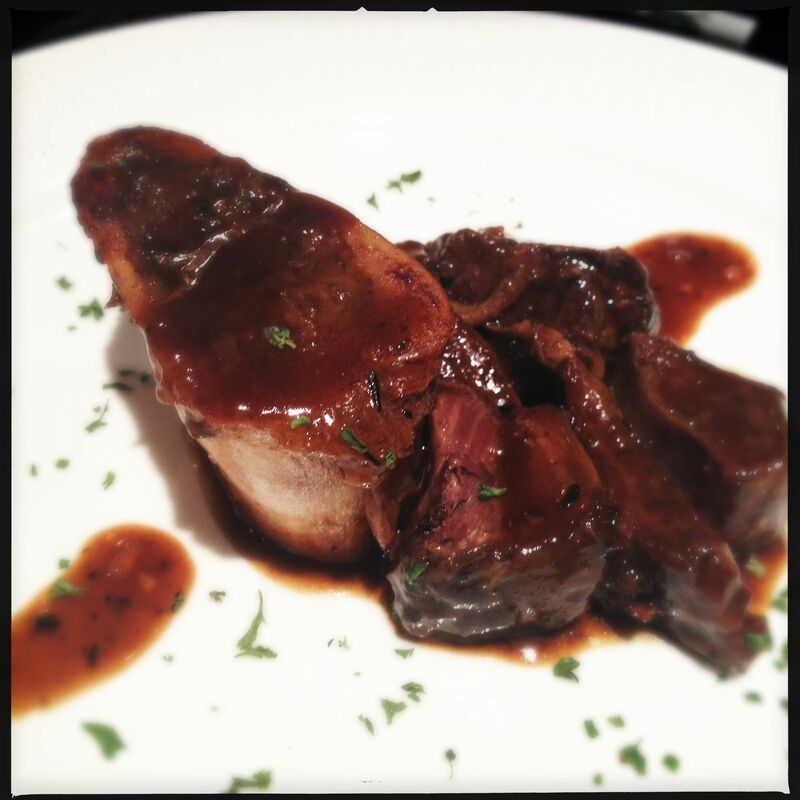 Old Rasputin Braised Bison Shanks | Food. Beer. Tunes. Drinking while cooking is fun. Listening to great music makes it even better. At the local farmers’ market a few weeks ago I actually remembered to bring more than my usual pocket change. Instead of leaving with nothing more than an heirloom tomato and a few ears of corn I stopped by the Lakeview Buffalo Farm stand and picked up a couple of shanks. This was my first time cooking with buffalo, so I was pretty stoked to see what I could do. 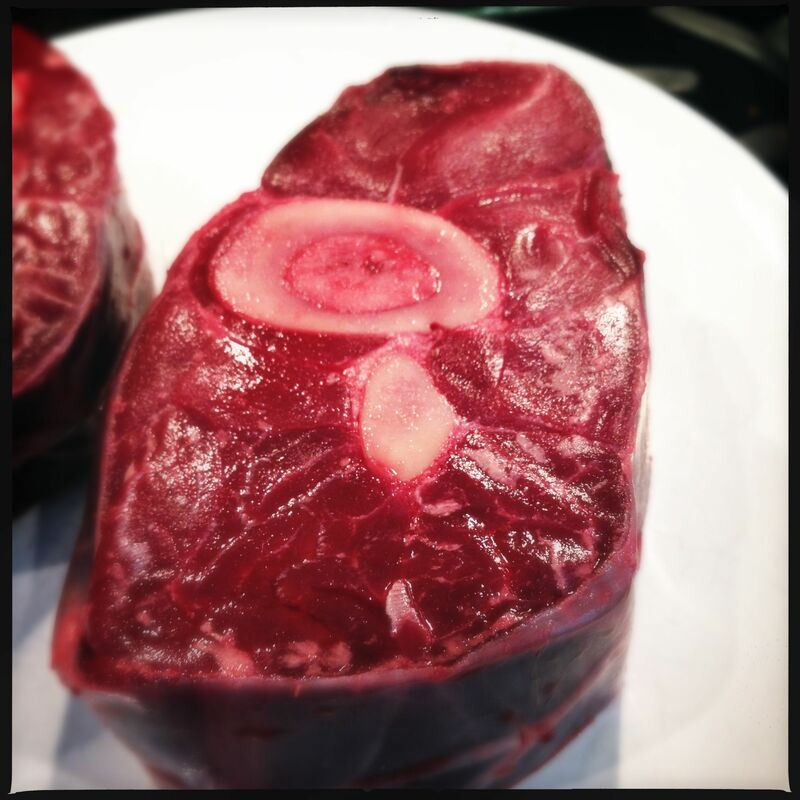 The folks at Lakeview recommended using the shanks in a stew or braising them. I’d been occasionally drooling on myself during the previous week thinking about braised meat, so the choice was easy. Let’s braise these suckers. I’m a big, big fan of North Coast Brewery’s Old Rasputin Russian Imperial Stout. A year or two ago I came across a recipe for Old Rasputin braised short ribs. With that as my inspiration, I decided to use a bottle of Old Raspy as part of the braising liquid for the shanks. Before I got started on the shanks I spent about 5 seconds thinking about what I wanted to listen to before I settled on this gem. 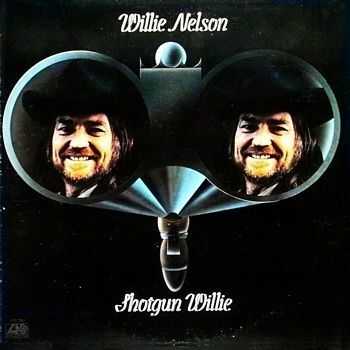 Willie Nelson’s Shotgun Willie. Just a fantastic opening line to this album. This one’s easily my favorite Willie album. Can’t say I know his entire catalog too well, but for my money, this one is damn good. The beer choice was an easy one too. I bought a 4-pack of Old Raspy and had three left after setting one aside to use for the shanks. Old Rasputin was one of the first craft beers I really fell in love with. It was my introduction to the incredibly powerful world of Russian Imperial Stouts. Motor oil in a bottle? Yes, please. Old Raspy is really, really good. It’s strong and flavorful, so paired with a lighter meal it might be overkill. But up against a rich braised meat it’s perfect. Also goes well with a cigar. Keep that in mind. Let’s cook these shanks already. A quick note before we start: This is going to take two days to cook. Ideally. You can definitely eat it after the first go around in the oven, but letting it sit overnight and reheating the next day will make it taste even better. First, preheat your oven to 275. Meanwhile, in a heavy-bottomed Dutch oven, heat 4 tbsp of the butter over medium-high heat. Dump the flour onto a plate. Sprinkle a good pinch or two of salt on all sides of the shanks and grind some pepper onto them. Dredge the shanks in the flour and brown them, one at a time, in the butter. When all sides are browned, set the shanks aside on a plate. Deglaze the pot with a splash of the Old Raspy, scraping up the tasty brown bits on the bottom. Then add the remaining 2 tbsp of butter followed by the carrots, celery, and onion, stirring occasionally for 6-8 minutes until softened. Place the shanks on top of the vegetables. Carefully pour in the Old Rasputin along with enough stock to not quite cover the meat. Also add the rosemary, thyme, bay leaves, peppercorns, and allspice berries. What we’re doing is making a flavorful braising liquid that will then be strained and reduced to a thick sauce for the final product. Bring the liquid to a boil. When it’s there, cover and transfer to the preheated oven. Braise for 4 hours. Relax. Drink another Old Raspy or two. After 4 hours, turn off the oven and leave the pot in the oven for an additional hour. Here’s where it gets crazy: take the pot out of the oven and put it in your fridge overnight. It’s flavor-melding time. The next day, 3 hours or so before you’re ready to eat, warm your oven to 250 degrees. If you’d like, scrape off the hardened layer of fat on top of the braising liquid. I scraped off about half of it as I wanted to keep some of the fat for flavor. Put the pot back in the oven, uncovered, for 3 hours. After 3 hours, remove from the oven. Carefully pick out the shanks, which will be falling apart into delicious pieces, and put them on a plate. Don’t forget the bones. There’s a tasty marrow treat in there. Get a fine strainer or china cap, place it in a large pot or bowl, and pour the braising liquid through the strainer. 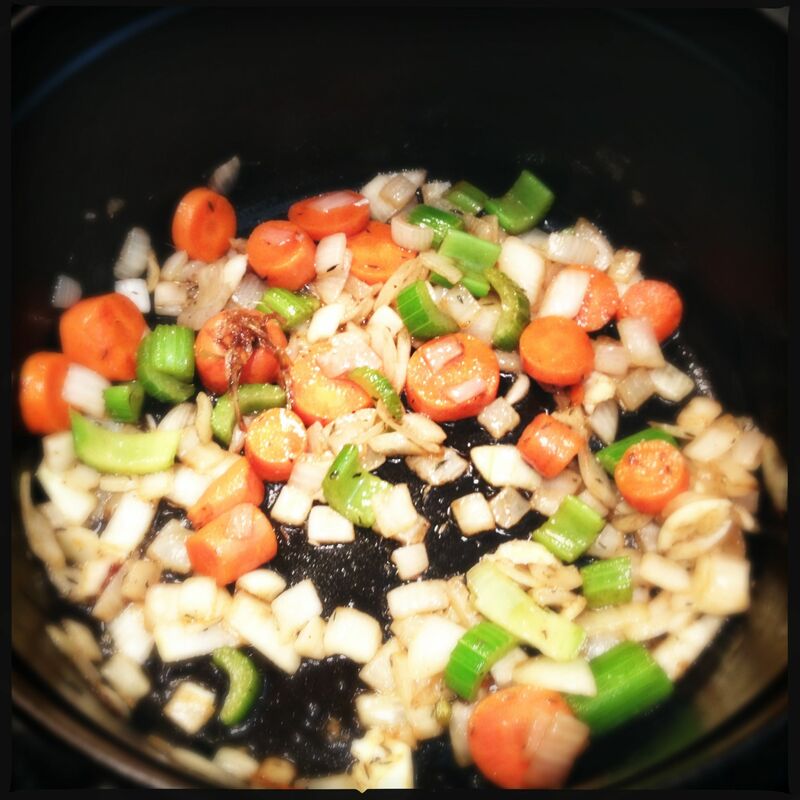 Discard the solids and return the liquid to your Dutch oven. Boil the liquid rapidly and reduce until it’s almost thick enough to coat the back of a spoon. If you can’t quite get it there, dissolve a spoonful of corn starch in a tablespoon of cool water and add to the liquid. That should thicken it up. You’ll want it to be the consistency of a moderately thick sauce, but not gravy-like. Once the sauce is thickened, remove from heat. Add kosher salt and black pepper to taste. Place the shanks back in the pot, and spoon some sauce over them to reheat them. Get two plates and place some meat and one bone on each plate. Spoon some sauce over the top. You can serve the shanks with any side you’d like, but I’d be inclined to go with some garlic mashed potatoes, roasted asparagus, or roasted fingerling potatoes. As you’re enjoying the shanks, don’t forget to try some of the marrow from the bones. I know. It sounds gross. And the consistency takes some getting used to. But the super-concentrated meaty flavor from the marrow is awesome. Trust me. If you want to cut the richness of the marrow, whip up a quick gremolata (minced lemon peel – yellow part only, 3 cloves minced garlic, and 1/4 cup finely chopped parsley) and use as a garnish. There it is. Crack open another Old Rasputin, turn up Shotgun Willie, and enjoy. 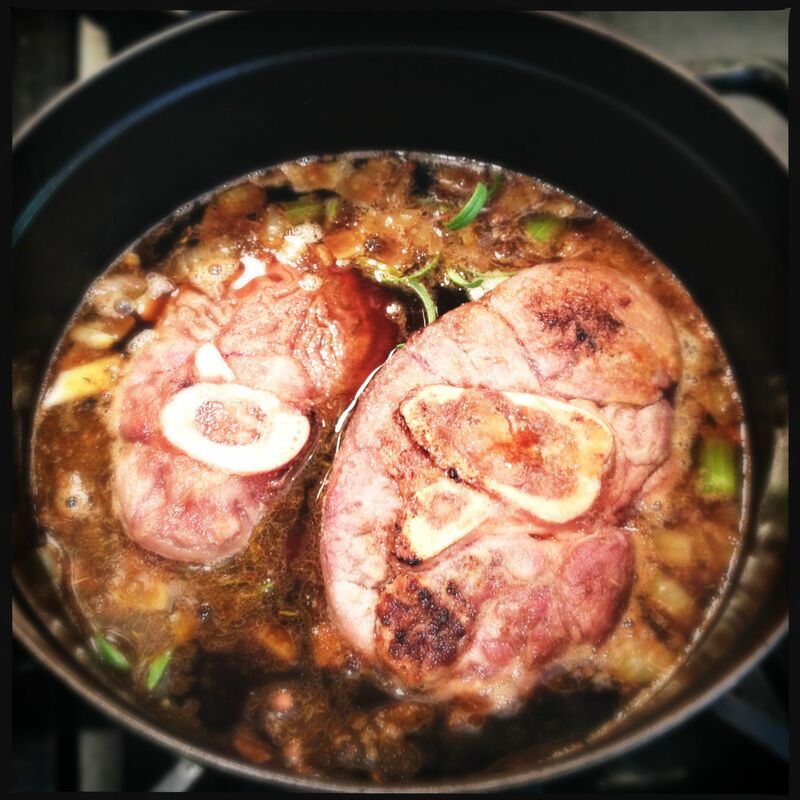 This entry was posted in Meats, Other Meats and tagged bison shanks, braised, cooking with beer, dutch oven, old rasputin, willie nelson by foodbeerandtunes. Bookmark the permalink.